A tip top performance by favourite Addictive Nature in the Group 2 $200,000 Kari Stan Fox Stakes (1500m) at Rosehill on Saturday could see him line up in the Group 1 $1m De Bortoli Wines Golden Rose (1400m) a fortnight later. Addictive Nature, above in green, black and white colours, is on trial for the Golden Rose when he runs in the Stan Fox Stakes at Rosehill. Photo by Steve Hart. 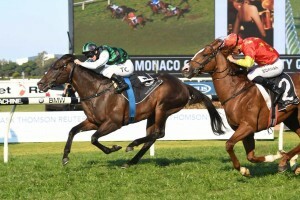 The lightly raced Addictive Nature is the winner of two of his three race starts and has been installed the $2.70 favourite for the Stan Fox Stakes at Labrokes.com.au after scoring an all the way win over the fast finishing Assimilate in the Group 3 $150,000 Monaco Cup – Ming Dynasty Quality (1400m) at Rosehill on August 26. “It’s very much one step at a time but if he does go well you have the Golden Rose two weeks away,’’ trainer Bjorn Baker told Racing New South Wales News. Baker said that Addictive Nature doesn’t have to lead to win and he wouldn’t be worried if Tim Clark was to take a sit on the Savabeel colt from barrier four in the field that has been reduced to seven runners following the early scratching of the Lindsay Park trained Esktiraak who is also engaged in the 1509m three year old Handicap at The Valley on Saturday. “There looks to be speed in there, in all his work and trials he has always sat off them and I don’t think he is one dimensional,’’ Baker said. Addictive Nature is currently marked at $13 for the Golden Rose which is also to be at Rosehill and a good performance could see the colt move closer to the top of the market order at Ladbrokes.com.au who have the Gerald Ryan trained Menari as the $5.50 favourite just shading Team Snowden’s smart colt Pariah at $6.50. Ryan also has a strong hand in the Stan Fox Stakes with $3.90 second favourite Trapeze Artist who will also be fitter for a first up sixth to Dracarys in the Group 3 $150,000 Up and Coming Stakes (1300m) at Randwick on August 19. Ryan has subsequently barrier trialled Trapeze Artist for a win over 1020m at Rosehill on September 4 and the experienced trained has removed the blinkers from the Snitzel colt for Saturday’s assignment. On the third line of Stan Fox Stakes betting at $4.50 is the Gai Waterhouse and Adrian Bott trained Gold Standard who is coming off a tidy second to Dracarys in the Up And Coming Stakes.